The 18ft 8in Tango Escape is a couple’s van with a wow-factor interior. What a difference 2in makes. That’s what went through my mind when stepping inside the 18ft 8in Escape by Tango Caravans. You see, a few months ago, we reviewed the 18ft 6in Escape – both single-axle vans – and for all of its features and wow factor, the rear bathroom was on the squeezy side. Don’t get me wrong: we said at the time that the 18ft 6in Escape was one of the best-value vans in Australia, but I think this slightly larger Escape might just have an edge on its little brother. Tango Caravans has been on the Australian RV scene for a few years now. Its vans present as neat, tidy examples of timber-framed, aluminium-clad bitumen-bound tourers with particularly well-styled interiors. The layout of the 18ft 8in Tango Escape incorporates a forward queen-size bed, an offside dinette, a kitchen opposite, and a full-width rear bathroom. And it’s in the bathroom that those two extra inches come into play. The bathroom is fitted out with an offside toilet, central vanity, and nearside moulded-fibreglass shower. There’s a large linen cupboard, overhead and under-sink cupboards, and a top-loader washing machine hidden beneath the benchtop. Those extra 50mm certainly makes the bathroom in this van feel more liveable over the long term. The dinette contains a tri-fold table with a small storage cupboard below and three overhead lockers, not to mention snap-up footrests. These footrests, however, mean there’s no side access to the storage space under the dinette seats – you’ll need to remove the cushions and ply bases. The gas-electric hot water service is positioned under the forward lounge, so storage space is minimal there anyway, but the rearmost seat is yours to fill with board games, spare blankets and the like. On a side note, all locker doors are secured with piano hinges – the overhead lockers open on gas struts, too – and the LED strip lighting above these lockers in the kitchen and dinette adds to the already classy decor. 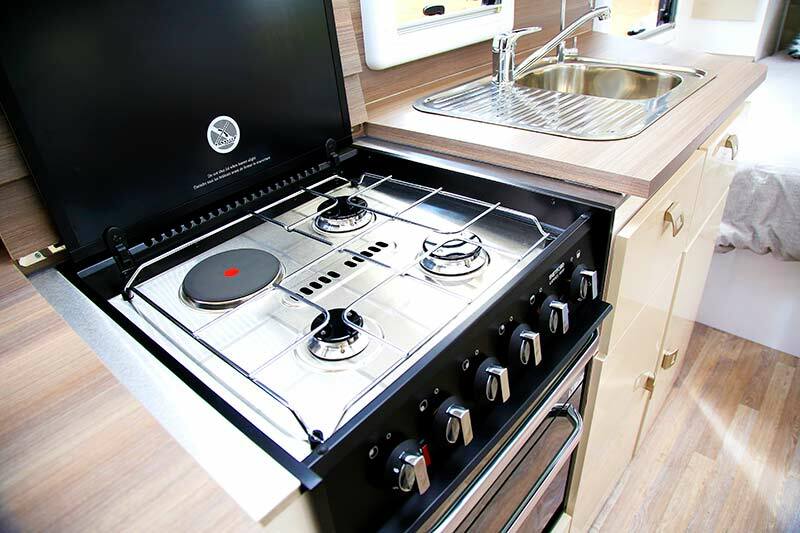 In the kitchen you’ll find a four-burner cooktop with griller and oven, and a sink with filtered drinking water. 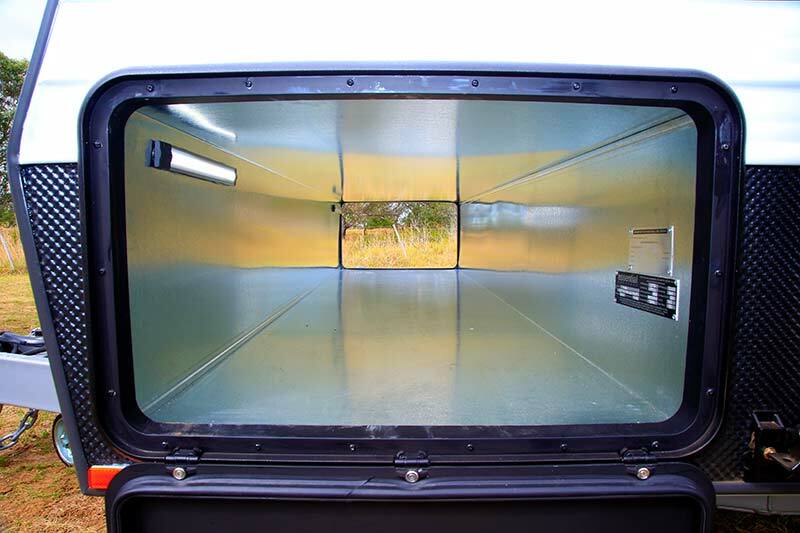 Now, bench space in this van is in short supply; however, there’s a hinged section of bench above the recessed cooktop that can be used when the cooktop is not. Between the dinette and bathroom is the Dometic 190L AES fridge-freezer with NCE microwave neatly recessed above. I did wonder if Tango could fit a small cupboard above the microwave. Like the dinette, the bedroom contains a couple of multi-directional LED reading lights. There are lockers above, wardrobes either side, and some storage space beneath the bed, which also lifts on gas struts. Now, the external tunnel boot does protrude into the under-bed space somewhat, and the 100Ah deep-cycle house battery is kept here, too, but you’d still be able to stow your portable solar panel here and plenty of other items. 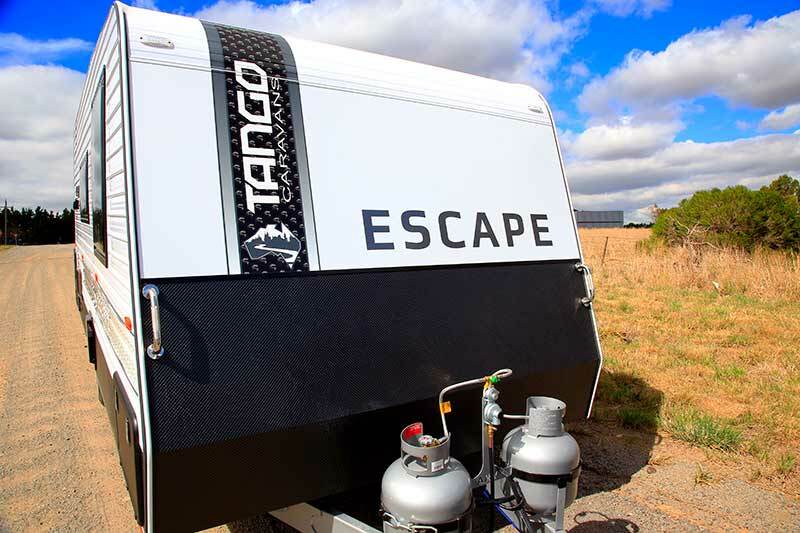 In terms of enterainment, the 18ft 8in Tango Escape has a 24in flatscreen TV (with Winegard antenna) on a swivel arm at the forward end of the kitchen, and a CD/radio/MP3 player fitted into the kitchen cabinetry, connected to ceiling-mounted speakers. This van’s interior visual appeal is self-evident – I even like the padded bedhead and mirror above. And while the layout doesn’t break any moulds, it is a sensible layout for two people, given the van’s dimensions. The 18ft 8in Tango Escape is built on a 6in DuraGal chassis with Dexter Torflex independent suspension. Two 95L gal-protected water tanks are fitted; however, a grey water tank isn’t. From a distance, you might be forgiven for seeing yet another timber-framed, alumninium-clad caravan. But this Escape has at least one important difference: along its sides, and on the front and back, it sports a material known as X-plate, instead of the conventional black or silver checkerplate. This material is said to be stronger and more durable than its checkerplate counterpart. Is this the case? Time will tell, and it’s finding its way onto more and more caravans in the market, but, aesthetically, it is an improvement. Up front, two 9kg gas cylinders are secured to the drawbar, though I reckon a guard for the regulator (or perhaps a full mesh stoneguard for the cylinders and regulator) wouldn’t go astray. At the rear, the Escape has a shower and camera, as well as a bumper-mounted spare wheel. The smooth black aluminium contrasts nicely against the white ribbed aluminium. Now, all Tango Escapes, except for the 19ft 6in model, can be fitted with the so-called Explore semi-offroad pack. This suite of upgrades includes a DO35 coupling, as opposed to the standard 50mm ball coupling, side X-plate at double the standard height, a grey water tank, a second 100Ah battery and more. Obviously, whether or not you went with the Explore pack would depend on how and where you travel, but in its standard format this van appears sufficiently equipped for extended trips, including a few days off-grid. The 150W solar panel (a second is included in the Explore pack) and 180L of onboard water are a good start in this regard. I said earlier that we once described the 18ft 6in version of this van as one Australia’s best-value caravans. But at $51,490 tow-away, this slightly larger model gives it a run for its money. It isn’t the biggest, showiest van out there, but what it does, it does well. And looks great doing it. Why not fit a cupboard above the microwave?